SanKritiLaya is pleased to sponsor a BharathaNatyam concert by the well known Saraswathi Gana Nilayam School from Chennai, for Spring 2009 season. Kalaimamani Smt. Ranganayaki Jayaraman, Director of SGN, is accompanied in this tour by her senior students - Binesh K. Mahadevan, Deepthi Swaroopini, Mahathi Achyutan, Namratha Naidu, Padmalaksshme Suresh, Padmashree Kodaganti,Preethi Muthuraman, Shivapriya and Sivasankari. Sri Saraswathy Gana Nilayam (SGN) was founded in 1939 by Late Smt. K. Lalitha, a disciple of Late Kattumannar Koil Muthukumaraswamy Pillai, to impart training in Bharatanatyam, Veena, and Vocal music to the children in the Triplicane neighborhood of Chennai. 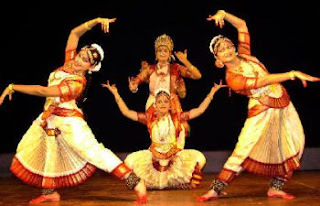 Today, the institution focuses on Bharatanatyam and continues to spread the art all over the world. The institution has trained numerous students in Bharatanatyam and so far 420 students have performed their arangetram (debut performance). Many SGN students now run their own Bharatanatyam schools throughout India, Middle East and United States. She has released six full length Bharatanatyam dance audio cassettes and CDs – Lalitha Vandanam, Nrithya Geetham, Bharatha Geetham, Guru Samarpanam, Nardhana Priya, Krishnam Smarami, and Pranamamyaham. Smt. Ranganayaki received the prestigious Kalaimamani award from the Government of Tamilnadu in 1995, for her contribution to the art. She has been awarded the following titles/awards. Smt. Ranganayaki is a graded Veena artist in the All India Radio and has composed some popular Veena ensembles, such as ‘Pancha Tala Priya Malika’ and ‘Pancha Raga Oudava Malika’ for Doordarshan TV, India. Raj, please send email to secretary@sankritilaya.org with your contact address (email address? phone no etc..).